What a "hair raising" experience STATIC ELECTRICITY is! What can be more fun than having your hair styled by static electricity? 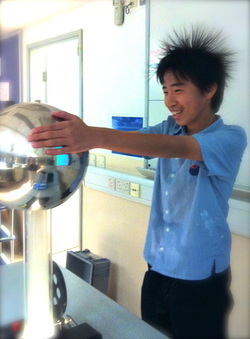 One of the activities of the Y9 physics class is to "play with"...sorry, sorry, sorry, I mean EXAMINE the effect of static electricity on the human body. There were a couple of brave souls in 9C starting including Anson, Matthew, Jason, Ryu, Kelly, and Hilary...but by far, Ryu had the most "hair raising" experience! Let's see who the brave ones will be from 9A and 9F! It might be a lot of fun, but you can still be ZAPPED! Ouch!